Mousse is a Creamy Dessert that incorporates air to give a light and airy texture. I normally avoid making some recipes at home due to the quantity of oil /butter /cheese, eggs etc., used. One such Recipe is Mousse, i always think that i am literally eating fat as such, due to the addition of egg yolks and cream. But when i came across this recipe i got so geared up to try this recipe. I am making this cake in a very less quantity for home purpose, you can double the quantity mentioned for mousse and make a bigger cake. I have allowed the cake to set for not even a day, only for about 18 hours. If you are planning to make a big cake, chill in refrigerator about 2 days for good results. The quantity i have mentioned below for a day is fine. Prepare a Chocolate Sponge Cake by using Chocolate Swiss Roll Sponge Cake method in tray or can even make normal Chocolate Sponge Cake in cake tin. Keep the tin on top of the sponge cake and cut the same size of your cake tin. Cut the sponge cake into as thin a cake as possible. Do not use the spring foam cake pan's bottom to set the cake. Instead use a cake base/ board as the bottom to place the sponge cake. Set aside. To prepare the Mousse chop the chocolate into small pieces. Heat approximately half of cream in a pan and bring it to boil. Once it starts to bubble turn off the heat and add the chopped chocolate pieces. Stir well the chocolate has melted in the heat and has become a smooth mixture. Meanwhile whip the egg white like meringue by adding two teaspoon of sugar till you get the soft peaks. Set aside. Pour the chocolate mixture into a bowl and add the rest half of the cream. Keep the bowl over a large bowl of ice water. Beat the whole mixture well using hand held electric beater or normal whisk till soft peaks form. Remove the bowl from ice water. Gently fold in this egg white with the chocolate mixture. Now you get the fluffy mousse ready to be set on top of the sponge. Keep the cut Chocolate sponge cake inside the cake pan. Then pour the prepared mousse over the sponge cake and smooth the top using a spatula. Cover the spring foam pan with Cling film and allow to chill/set inside the fridge for about a day. If you are doubling the quantity mentioned. Chill for 2 days for good results. Unmould the cake by running a knife through the edges of the cake or heat the cake pans outer side by blowtorch. I have garnished the cake in a very easy way by piping the cream in a circular manner. You can garnish the way you like. Notes: This mousse you can prepare and serve in glasses too without the addition of sponge cake. 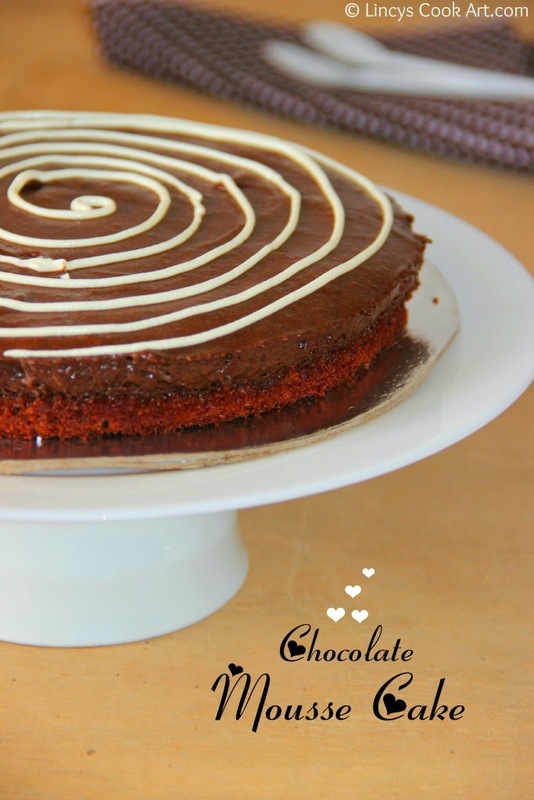 Super inviting and delicious chocolate mousse cake......!!! Drooling over here....mouthmelting mousse cake. Lovely cake...you are tempting me Dear!!!! Inviting you to link your chocolate recipes to the on going event at my space. Is there any option if i want to skip the egg?